The lodge is elevated into the tree tops and is surrounded by forest. Built from natural stone, wood, ceiling-to-floor windows and sky-lite roofs, each room offers a unique view of the forest. 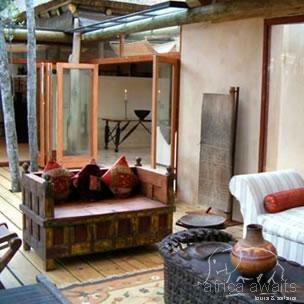 This secluded hideaway's two lodges are almost identical in design with tastefully and exquisitely decorated interiors. The utmost attention to detail has been afforded using the finest Egyptian linen, silks and crystal to complement the exotic antique and African art treasures. Ceiling windows and blinds create an inviting and romantic ambience. 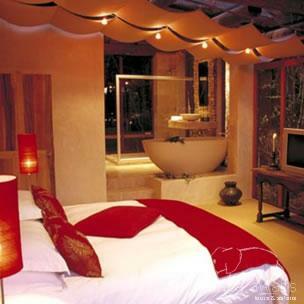 Tomba Lodge accommodates up to six guests in a Master suite and two Double Deluxe en-suite bedrooms. All guest areas have fireplaces adding a warm and cosy atmosphere. An entertainment room and spacious lounge, as well as an outdoor sitting area provide private spaces for individual guests to relax and unwind. From the enormous sundeck guests can enjoy expansive views of the Tsitsikamma mountains and forest. Malabar lodge houses Trogon House's restaurant and bar where breakfast, lunch, dinner and light meals are served. The Malabar family suite with twin bedroom is linked by elevated walkways to two double en-suite rooms. The atrium designed Forest Spa with its daybed, cosy fireplace, jacuzzi and sauna allows guests to relax in total seclusion whilst being "in the forest". Since November 2009, Trogon House offers its guests magical experiences at the Forest Boma (private barbecue area) and the possibility to connect with nature in the tranquility of the forest. Located between Malabar and Tomba lodge, the Forest Boma can be accessed through a newly built ramp that connects the two lodges. Whilst the lodges are elevated and surrounded by the forest, the boma is located on ground level in the forest shielded by the canopy of the surrounding trees. The boma structure will include seating where guests will be able to relax on comfortable, luxurious cushions whilst the theme is still African informal. During the evenings, a log fire and oil lamps light up the area and add to the ambiance. Delicious South African cuisine such as potjiekos and barbecues will be served around the log fire for a minimum of four guests. The Boma area is the perfect place to experience this South African tradition, to share a beat during African drumming or celebrate a special occasion such as weddings for up to twenty guests. Specifically for couples, the Forest Boma can be booked for a classy dinner for two at exclusive use, depending on availability. Contrary to the casual style of the South African evenings, the setup for the couple's dinner is dramatic and romantic, using silver candelabra and porcelain crockery. During the day, the Boma can be transformed into a picturesque setting for a massage amidst the tranquillity and soothing sounds of the forest. The two lodges are carefully positioned and designed to ensure that guests at each lodge have a feeling of total seclusion and privacy. An unobtrusive pathway links the two lodges making the entire property ideal for a small group or incentive. If you want to book one room, one lodge or the entire lodge for up to 16 guests - Trogon House is ideal for romantic couples, a party of close friends and family, an intimate wedding or an exclusive group. Trogon House and Forest Spa provides a sanctuary of peace and serenity that allows guests to unwind and enjoy luxury in natural surroundings. 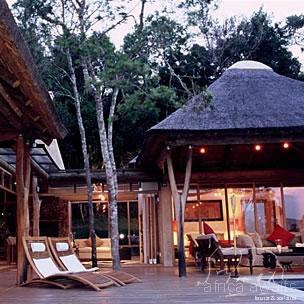 With your holiday, safari or business trip from in to Trogon House and Forest Spa in The Garden Route.